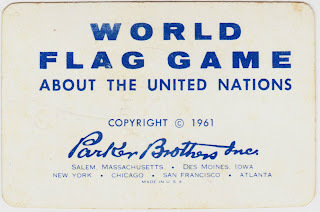 Among the miscellaneous items that I picked up last year from a local auction were the playing cards and instructions for the 1961 Parker Brothers1 game "World Flag Game About the United Nations." 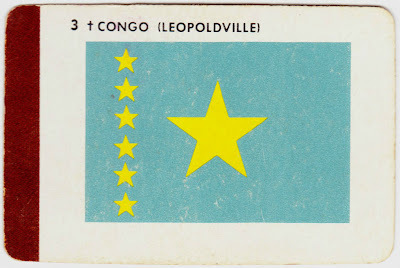 The flag cards are very small, measuring just 2½ inches wide by 1⅝ inches tall. "This game has been published in cooperation with the Office of Public Information of the United Nations. 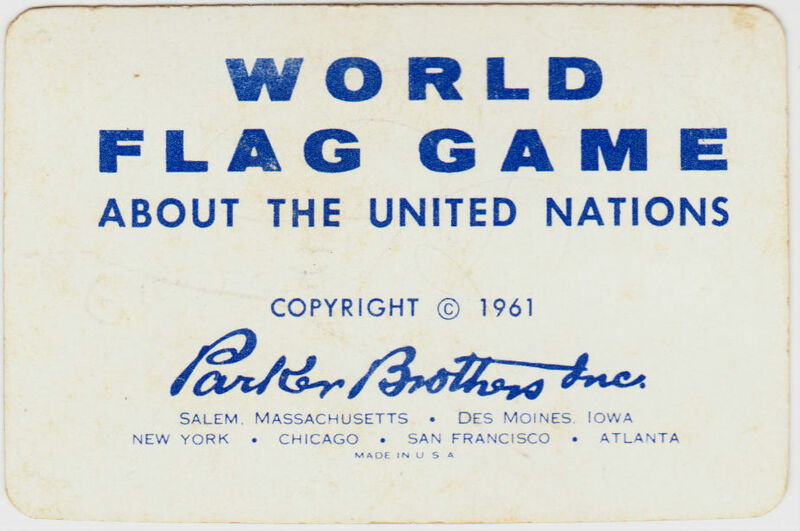 With four exceptions all of the countries appearing on the board were members or prospective members of the United Nations as of July 31, 1960. The four exceptions are the two German Republics (both appear in the same square), Switzerland, and the Peoples Republic of China. These important land areas are essential to the play of this game." Above: Switzerland got the "NOT A MEMBER OF UNITED NATIONS" stamp, even though one of the organization's primary headquarters is located there. 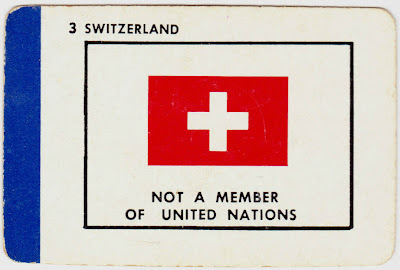 Switzerland did not join the United Nations until 2002. 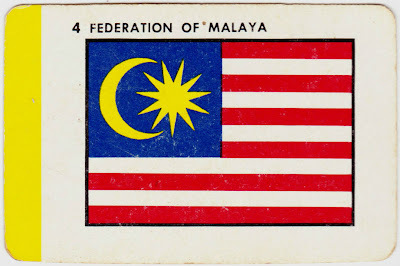 Above: The Federation of Malaya was in existence from 1948 to 1963. It was reconstituted as Malaysia in 1963 and kept the same flag. 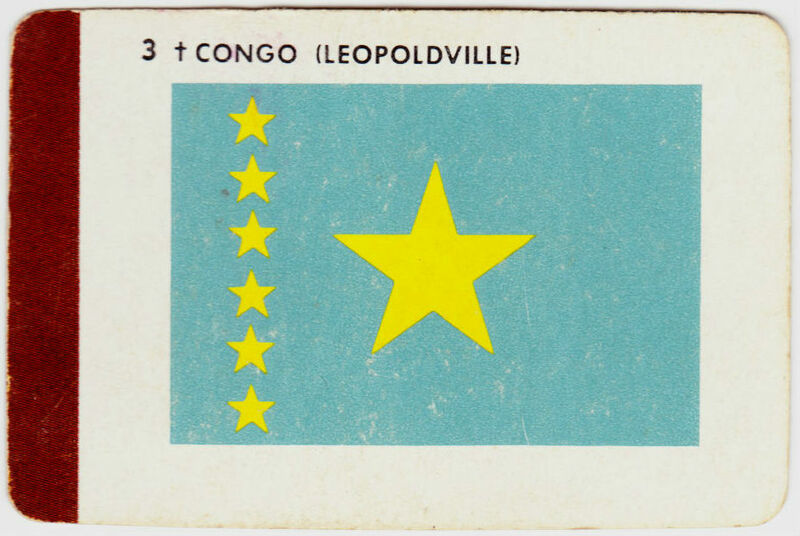 Léopoldville is now known as Kinshasa3, a city of 10 million in the Democratic Republic of the Congo. Above: This two-country card was stamped with "NOT MEMBERS OF UNITED NATIONS." 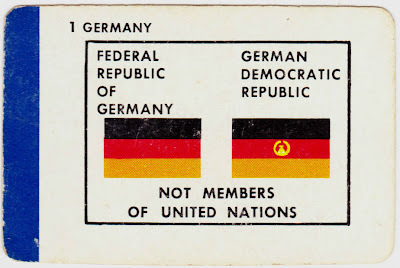 The Federal Republic of Germany (West Germany) and the German Democratic Republic (East Germany) both were admitted as members in September 1973. 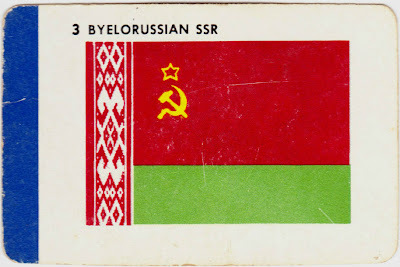 Above: The Byelorussian Soviet Socialist Republic (1920-1991) was one of the four original founding members of the Soviet Union in 1922. 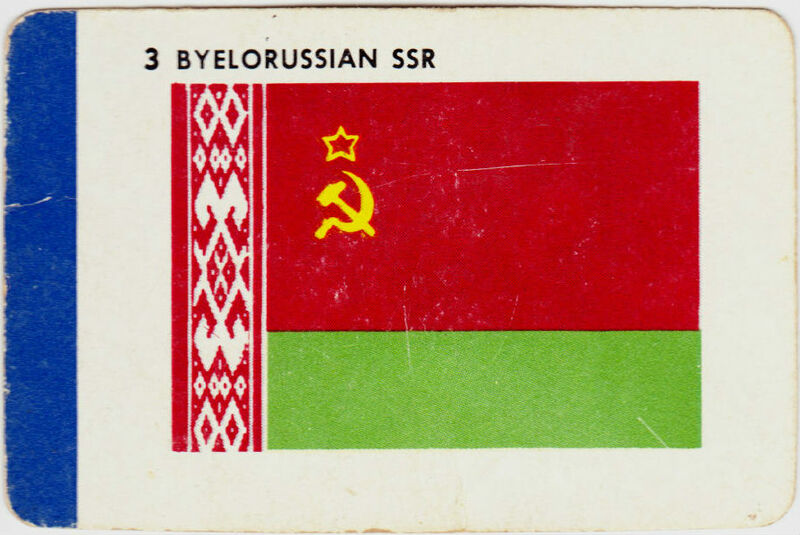 It became the Republic of Belarus (Беларусь) in 1991, following the dissolution of the Soviet Union. Its flag remained similar after 1991, with the golden hammer and sickle and the red star being removed. Above: The Mali Federation was sort of the Moonlight Graham of countries. It barely had time for a cup of coffee in the majors. According to Wikipedia, it was formed by a union between Senegal and the Sudanese Republic and became entirely self-governing when it gained independence from France on June 20, 1960. 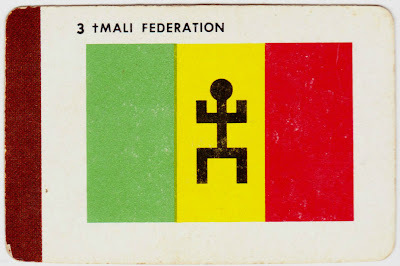 Two months later, on August 20, 1960, the Mali Federation collapsed when Senegal withdrew over political disagreements. The Sudanese Republic was renamed the Republic of Mali in September 1960. The flag's color pattern remained the same, but the human figure quickly disappeared. Why? According to WorldFlags101.com, "A 'kanaga' symbol was used on the first Mali flag, until it was abolished in 1961. The symbol is a black human-like image and it was removed because of pressure from Muslims who do not approve of making images in the human form." 2. BoardGameGeek.com has an informative entry for this game, complete with a slideshow of images. The users have given it a rating of 5.57 out of 10. But a few commenters have fond memories of it, including one who states: "An old 'classic' that I played in my youth. Recently acquired and still greatly enjoying it. I contemplated giving this game a '10' for it's longevity. My children like the game too, although they don't understand the subtle strategy involved. Still love it!" 3. Former professional athletes Dikembe Mutombo and Tim Biakabutuka were both born in Kinshasa. Their full names, by the way, are Dikembe Mutombo Mpolondo Mukamba Jean-Jacques Wamutombo and Tshimanga Biakabutuka. The wiki says that the Ukrainian SSR become one of founding members of the United Nations (UN) together with the Soviet Union and the Byelorussian SSR. This was part of a deal with the United States to ensure a degree of balance in the General Assembly, which, the USSR opined, was unbalanced in favor of the Western Bloc. The fourth Soviet founding member,the Transcaucasian SSR, didn't make it into the UN because it was dissolved in 1936 and divided among the Georgian, Armenian and Azerbaijan SSRs.